Handy Library - Free Web/OPAC Search. 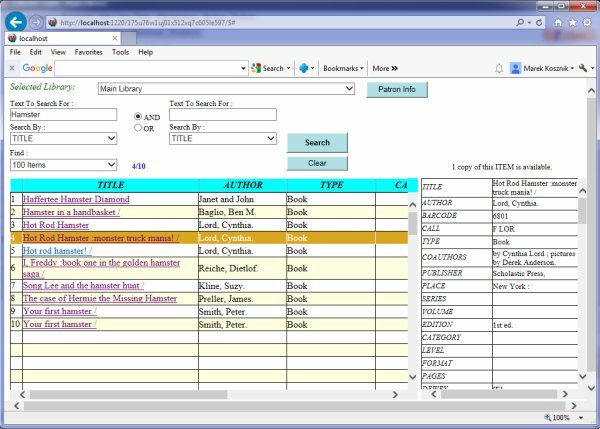 Handy Library Manager, version 2.0 or up, supports free Library Web Search (OPAC). From a browser on the computer with Handy Library Manager installed. From any browser connected to the Internet. Handy Library Manager is installed on the Web Server Computer. Library members have access to the web search page. From any browser connected to the Intranet/Network. Handy Library Manager is installed on the Intranet/Network Server Computer. Handy Server Monitor application (lib_svmon.exe) is listed in the C:\handy_lib\ folder (1). 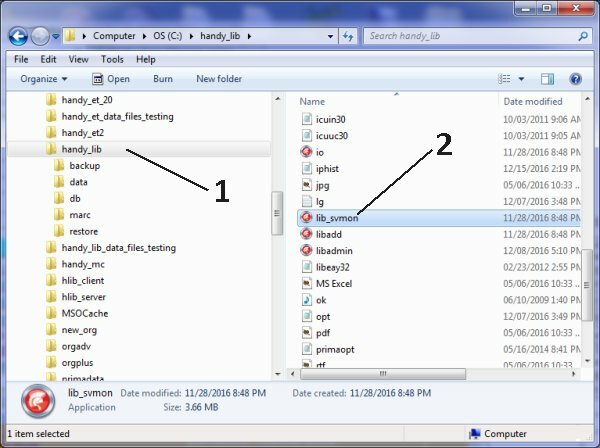 Start Handy Server Monitor (2) application. 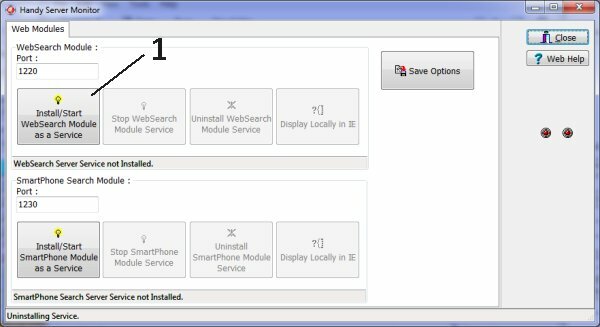 Click Install/Start WebSearch Module as a Service (1). Review message in the status line. The line should display: WebSearch Server Service Running. 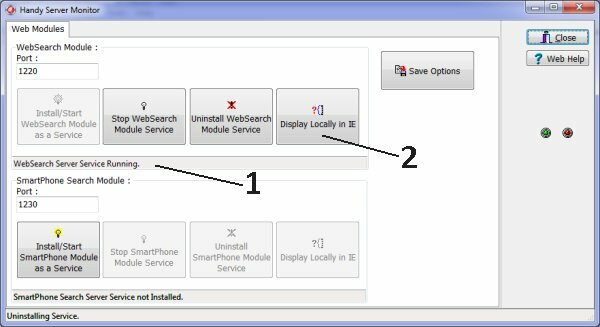 Click Display Locally in IE (2) to test the search in your Internet Explorer. link to activate the search in another browser (Chrome for example). Web search on local host computer. Web search with sample results. The web search is running on the web server computer. Question: Is there a way to link the database to the church website so that searches (eg. author, title, subject) can be done online? 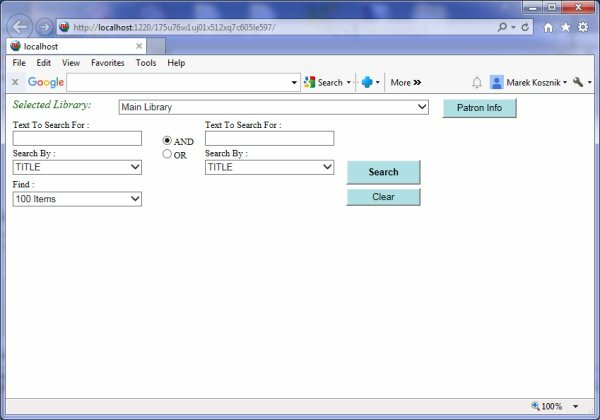 The above topic explians how to set library web search. Question: With Handy is there a way for patrons to access our library catalog online? Ask you IT personnel if you computer supports running web application. Question: I work at a Museum that is researching library database software for our print collection. I see that you offer an OPAC? Can you tell me more about how a library database can be web searchable using your software? Please review with your IT personnel if your computer supports: the computer needs a static IP address and supports access from the web or network computers. Question: Church Library; Our church has the software installed on a standalone PC. I have been asked by the librarian if it is possible allow church members to access the library catalogue from the web to allow people to look things up at home. It looks like you have some products that might meet our needs but I am not sure by just reading the descriptions which product would be best. I would like to talk to someone who to steer us in the right direction. Church has a dedicated server but the library software currently runs on a standalone machine. If the library system is installed on the dedicated server it will support our Web Search feature. Church members will have access to the library catalogue from the web at home. How to launch library web search service application? 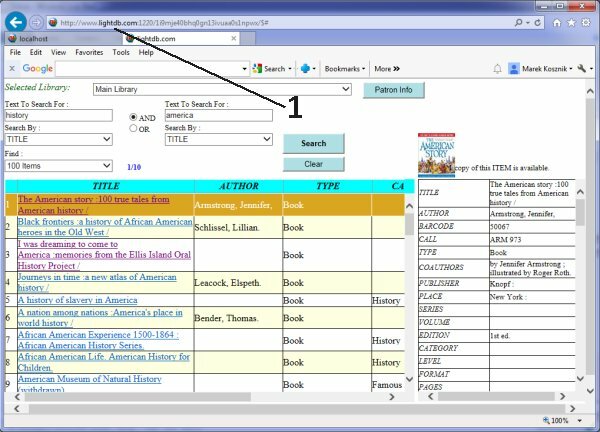 How to display library web search (OPAC) in a browser?